ONE UNDENIABLE JOY of having kids is seeing them discover the things you love. Johanna has found her way to drawing, word games, Vietnamese food and tacos with only gentle nudges from her father. There may be more Nurture than Nature at play here, but it’s not like everything takes. She shows no inclination toward long walks or PBS Frontline. In the case of music, my own most persistent passion, Jo’s ardor has been slower to form. There was a Michael Jackson phase, an Abba dalliance (Sarah’s doing) and a handful of tunes that get her dancing. But true fanaticism—that intense yearning to collect, listen, decipher and crank the volume—has eluded her. Until she discovered the Beatles. It started in Johanna’s 2nd grade classroom with a unit called “Beatle Mania!” (one of so many reasons her school rocks). She was coming home full of Fab Four trivia (You know how Ringo got his name? Did you know they had Mop Tops before they got into uniforms?) and inquiring who we thought was cutest. Things went quickly from Teeny Bopper curiosity to full-blown obsession. 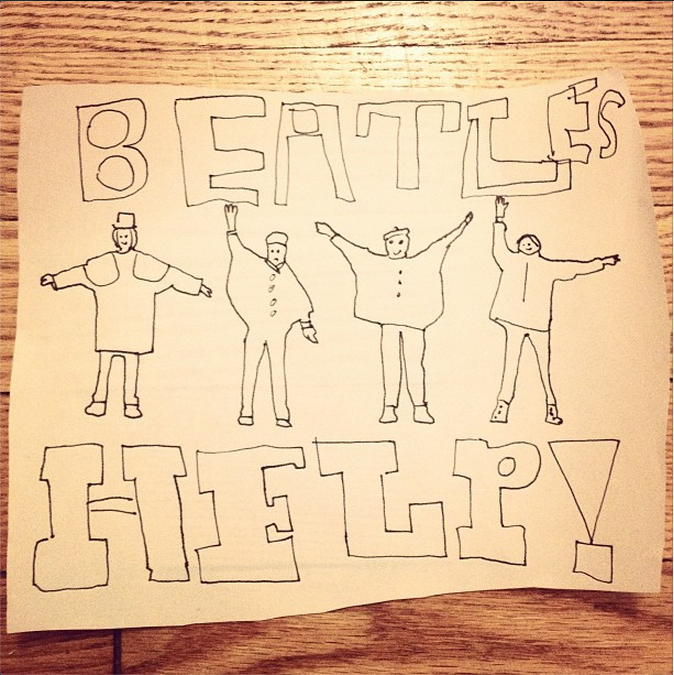 By the time of her class performance this month—100 seven year olds talk-singing Yellow Submarine and Let It Be with a live band—she was collecting MP3s, dissecting lyrics, tracing record covers and making Paul paper dolls. More than one morning we’ve awakened to “Back in the USSR” or “Come Together” blaring through her wall. “The White Album is probably my favorite. Except for Wild Honey Pie.” “Is this a John song?” “Why are there so many songs about Sun and Sunshine?” Our budding Beatlologist. I went to New York for a (unrelated) conference during the 50th anniversary of the Beatles arrival in America, remembered for their performance on Ed Sullivan, even booking the same hotel they stayed at by coincidence. Last week on George’s 71st birthday we gathered for an hour of Harrison deep cuts on Bop Street. Jo’s friend Rey got a homemade Yellow Submarine cake for his 8th birthday. Beatlemania enfolds us utterly. When hand-claps are called for in “8 Days a Week,” none of us can resist. Any other wall-to-wall cultural phenomenon would make my eyes roll back in no time. But—and I’m only the hundred-millionth person to say this—the Beatles are different. Their catalog is so vast, their style so varied. Four months into Jo’s crazy love affair, I’m hearing it as if with virgin ears, finding new shading in familiar songs, even discovering stuff I overlooked. With the possible exception of “Hey Jude” or “I Want to Hold Your Hand,” it all feels strikingly fresh. I’m fan-boying out on the ultimate rock-and-roll cliché. For the sake of intergenerational harmony, I can’t stop.